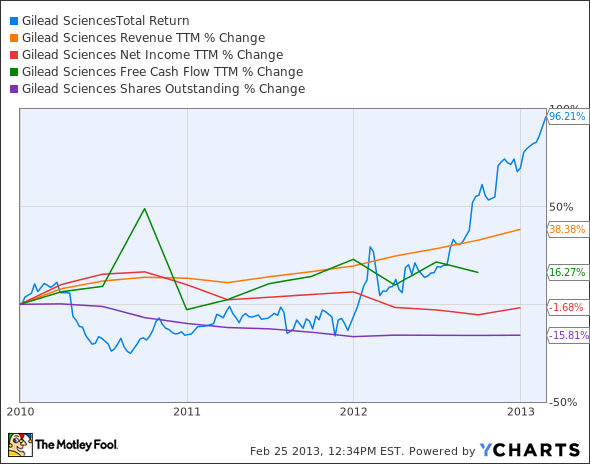 Is Gilead Sciences Destined for Greatness? Let's see what the numbers say. Every investor can appreciate a stock that consistently beats the Street without getting ahead of its fundamentals and risking a meltdown. The best stocks offer sustainable market-beating gains, with improving financial metrics that support strong price growth. Let's take a look at what Gilead Sciences' (NASDAQ:GILD) recent results tell us about its potential for future gains. The graphs you're about to see tell Gilead's story, and we'll be grading the quality of that story in several ways. Growth is important on both top and bottom lines, and an improving profit margin is a great sign that a company's become more efficient over time. Since profits may not always reported at a steady rate, we'll also look at how much Gilead's free cash flow has grown in comparison to its net income. A company that generates more earnings per share over time, regardless of the number of shares outstanding, is heading in the right direction. If Gilead's share price has kept pace with its earnings growth, that's another good sign that its stock can move higher. Is Gilead managing its resources well? 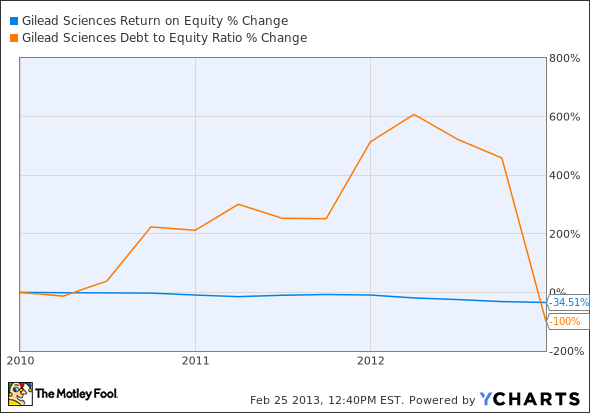 A company's return on equity should be improving, and its debt to equity ratio declining, if it's to earn our approval. GILD Total Return Price data by YCharts. Source: YCharts. *Period begins at end of Q3 2009. GILD Return on Equity data by YCharts. Gilead gets by with four out of seven passing grades. It's not a great showing, particularly in terms of Gilead's bottom line, which has been left far behind by its share-price growth. As a result, Gilead is now one of the costliest major drugmakers on the market, with a P/E ratio double that of Pfizer's (NYSE:PFE) and nearly double Eli Lilly's. On the other hand, Gilead has gotten some great results out of recent trials that neither of these companies can match. Will that be enough to justify the past year's surge in investor optimism and bring Gilead's score up the next time we take a look? The big news these days is undoubtedly Gilead's sofosbuvir, a very promising hepatitis-C drug that's passing its trials with flying colors. Gilead is already a leading producer of hepatitis-B treatments with Viread, which is also used to treat HIV. A successful patent settlement with Teva Pharmaceutical (NYSE:TEVA) keeps that drug under Gilead's thumb until 2017, but losing that drug's exclusivity will hurt -- approximately 350 million people around the world are afflicted with hep B, and an estimated 620,000 die of the disease each year. That compares to approximately 200 million people worldwide with hep C, but Gilead's not alone in trying to treat this large patient base. AbbVie (NYSE:ABBV) is also moving a Hep C drug through trials, and its near-perfect cure rate makes it look like the drugmaker to beat at the moment. Nor is Gilead's lucrative HIV-treatment dominance unchallenged. Pfizer and GlaxoSmithKline are moving dolutegravir, a challenger to Gilead's four-in-one treatment, through phase 3 trials at the moment. Gilead's expanding from these two lucrative treatment areas into myelofibrosis drugs, both through an internally developed drug called simtuzumab and through its acquisition of small biotech YM Biosciences, which has been working on a drug to treat the same disease through a different action mechanism. That, as my fellow Fool Brian Orelli points out, could lead to a combo drug similar to its four-in-one HIV drug Stribild. This is a much less common disease than the hepatitis variants, afflicting roughly one of every 500,000 people worldwide. It'll have to compete against Incyte's (NASDAQ:INCY) Jakafi, which has been performing about as well as a drug developed for one out of every 500,000 people might be expected to. Sofosbuvir, as my Foolish colleague Sean Williams notes, might be one drug hopeful that could change lives (and portfolios). Will it be able to stand up against AbbVie's competition? That remains to be seen. It's looking like sofosbuvir will be approved this year, likely before AbbVie's drug will, so we might see a turnaround on these scores sooner rather than later. Keep track of Gilead by adding it to your free stock watchlist.